On July 13, Jean and I saw Heather and Tyler off from the delightfully small Durango Airport. We then headed south into New Mexico. 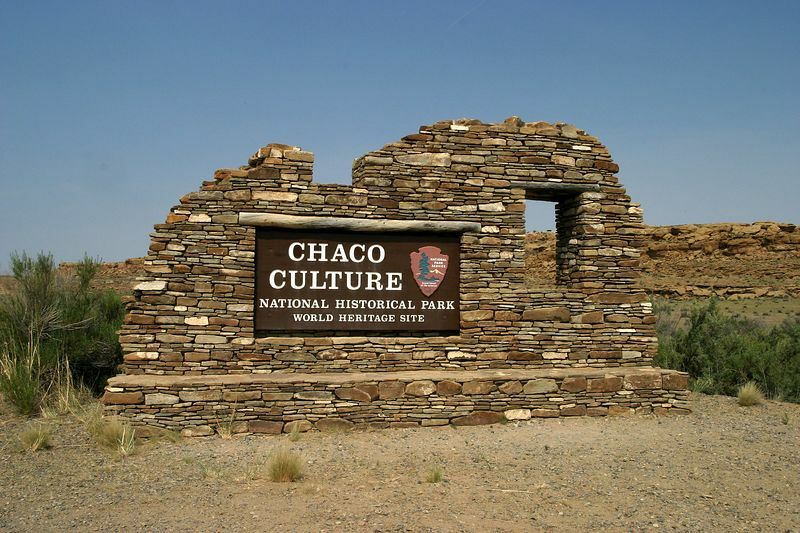 Peter Urone, a physics professor at Sac State told me about a mysterious and little-known Anasazi (Ancestral Puebloan) ruin called Chaco Canyon, and we off to investigate. Just south of Nageezi (more a dot on a map than an actual place), you turn onto a county road. This leads to a washboard dirt road. Which takes you to the park, seventeen miles away. You'll be washboarding it for the better part of an hour before you see the entrance sign for the park, so don't be in a hurry. Upon emerging from the 17-mile washboard road, visitors are greeted by this beautiful entrance sign.